Originally developed as a structural frame for the CATSAT project; the Multi-Payload Adapter frame provides a robust configurable structure. 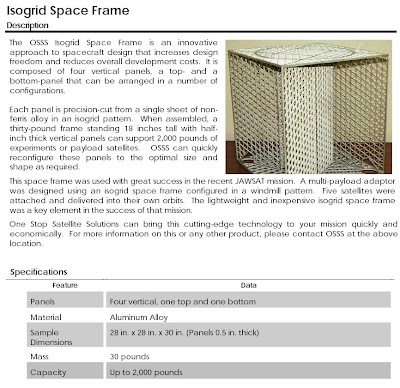 It consists of an Isogrid construct featuring a thru hole mounting point for a number 10 machine screw every 1.5 inches with the run of the grid and 2.6 inches against the run of the grid. The hole may then be taped via the use of a locking heli-coil for blind hole requirements as needed. The windmill bay configuration of the frame provided up to three sides (two sides and the bottom or top) of a right triangle for mounting a structure into the frame. This three dimensional mounting configuration required an extremely tight tolerancing with a .005 tolerance from hole to hole in the grid and .005 from hole to datum's A, B and C.
The isogrid pattern can be interrupted at any desirable point to provide structural material for hard point mounts for structural interconnections, camera ports, large connectors, adapter rings and/or payload separation systems. Cut from a billit of 3/8" plate 7075-T6 aluminum the isogrid structure provides an 80% weight reduction of material and retains 80% the strength.